One of the great joys of Christmas time is driving around and admiring all the beautiful lights around Nashville. From simple strings of lights that adorn gutters to singing Santas and reindeer that stand proudly on rooftops, there seems to be something for everyone. But with all this Christmas celebration, comes some hard work. Not only does it take time to set up Christmas lights and decorations, but taking them down can also be quite a grueling task. 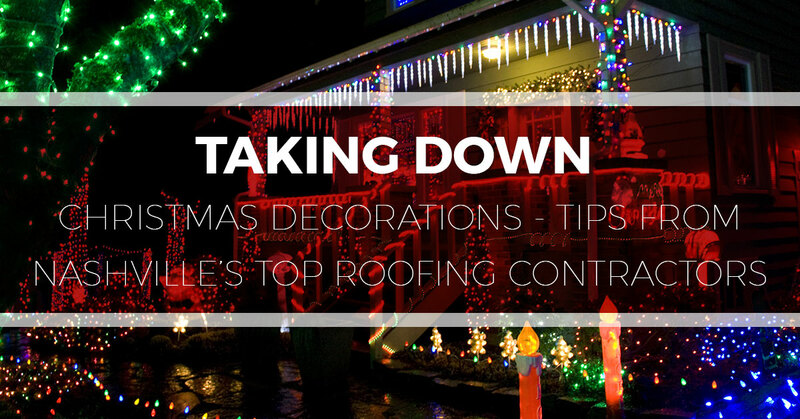 Although we don’t want to cut the holiday season short by getting you to think about post-Christmas cleanup, we would like to offer some tips on removing decorations and lights from your roof. As Nashville’s most trusted roofing contractors, we don’t just care about your roofs—we care about you, too! So keep these tips in mind when you’re cleaning up after the holidays, and remember to call us for all your roofing services. Chances are after the holidays have passed, it’s going to be quite nippy outside. If it is raining, snowing, or bitterly cold on the day you intend to take down lights and decorations, consider postponing the cleanup. Additionally, though you will want to be warm, you will also want to be wary of wearing a mobility-hindering-level of layers. This could cause you to lose balance. Similarly, don’t wear big bulky gloves. This might interfere with your grip and cause you to drop objects, which then might cause to slip and fall while trying to recover. The National Fire Protection Association (NFPA) says that the longer you leave your decorations up, the greater your risk of a house fire is. Not only does it add to your risk of fire, but who wants to be that family that has their lights up in the middle of February? Okay, so this isn’t an essential part of taking down Christmas lights, but if you are up there, you might as well perform a quick little roof inspection. However, never over-reach or do more than you feel comfortable doing. Better yet—if you spot a potential problem with your roof, contact your local roofing company, Tim Leeper Roofing. Our roofing contractors can come and inspect and perform any necessary roof maintenance or repairs. As Nashville’s top roofing company, we take pride in the quality of our work and in the fact that we can handle all of your roofing needs. From commercial roofs to residential roofs, we can perform everything from a total roof installation to a simple roof repair. Contact us to learn more or to get your free quote.